And what a festival it will be! MayFest 2017 is set to feature dozens of special exhibits, demonstrations, artist’s receptions, gallery walks, free concerts, and art parades. More than “just painiting,” the event also offers enjoy culinary arts experiences, live music in Basin Park, and a street party thrown by artists. Take a look! This colorful, quirky, energetic, and often surprising parade is a favorite tradition for kicking-off of MayFest. The parade promises floats, art cars, walkers, dancers, musicians, jugglers, and the Africa in the Ozarks drum and dance group. This year’s parade theme, “ArtRageous to the Max,” pays tribute to the late artist Max Elbo. An original, multi-media production written, produced, and directed by a local group. Engaging, amusing, and guaranteed to please. Bridge of Love is a 6-day Mother’s Day Living Art Installation underneath the Main Street Air Bridge to help celebrate the women in our lives. Bring your own flowers to participate. The Grand Gallery Stroll is the mother of all gallery walks. Galleries will produce special exhibits for this casual-dress, drop in event. Refreshments will be served for those 21 and over. Books in Bloom is a literary festival for both writers and readers. Come out, meet authors, and hear them speak about their works and the publishing world. The 2nd Annual Plein Air Festival – “ESPAfest” – is over 60 artists from across the country coming together for four days of painting outdoors. Various beautiful and historic locations around Eureka Springs will be chosen for painting. These and many other great events are happening in Eureka Springs throughout the entirety of May. Don’t miss it! As of this writing, events are still coming together for MayFest 2017. 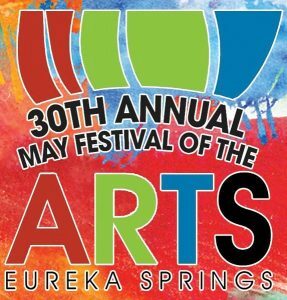 Be sure to visit www.eurekaspringsfestivalofthearts.com for a more details. You can also follow the festival on their Facebook page. MayFaest offers lots of opportunities for a fun family or weekend getaway! 5 Ojo Inn Bed & Breakfast offers 9 guest rooms and suites with exemplary amenities, historic charm, and unbelievable gourmet breakfasts. With over an acre of quiet woods to relax in yet just a short stroll from all the action downtown. Come experience Eureka Springs at the height of its beauty and let us share some of our famous Ozarks hospitality with you. Book your stay at 5 Ojo Inn Bed & Breakfast today!